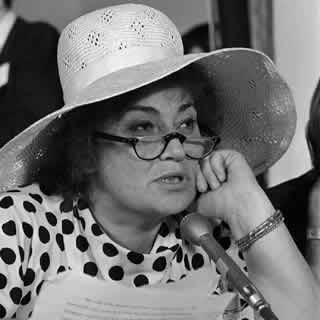 Bella Savitsky Abzug was an American lawyer, Congresswoman, social activist and a leader of the Women's Movement. In 1971 Abzug joined other leading feminists such as Gloria Steinem and Betty Friedan to found the National Women's Political Caucus. She famously declared "This woman's place is in the House–the House of Representatives" in her successful 1970 campaign to join that body when she became the first Jewish woman in the United States Congress. She was later appointed to chair the National Commission on the Observance of International Women's Year and to plan the 1977 National Women's Conference by President Gerald Ford and led President Jimmy Carter's commission on women. All the men on my staff can type.